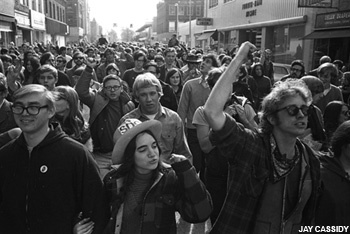 Election-day march through the streets of Ann Arbor, 1968. The mission of the Michigan History Project is to bring archives alive by telling the incredible, exciting tales of our state's past. We're developing many topics, such as a study of the myth and mystery surrounding General George Armstrong Custer — a fascinating character, both hero and villain, who grew up in Michigan, married a Michigan girl, and led a brigade of Michigan cavalry in the Civil War. We also plan to extensively document the history of Michigan sports. So many colorful, interesting, talented people. So many stirring, electrifying stories. All brought to vivid life by the use of thousands of stunning images. The Michigan History Project has acquired the Ann Arbor News' archive of University of Michigan sports photos, and that's just the beginning. We're seeking other dramatic images of sports that can help us document our state's history of excellence in athletics. Other topics that we're developing include the origins and early days of Motown Records, feisty abolitionist Laura Smith Haviland, and Albert Kahn, the father of modern industrial architecture. But by far the most interesting subject we're working on is what happened in the city of Ann Arbor during the 1960s. 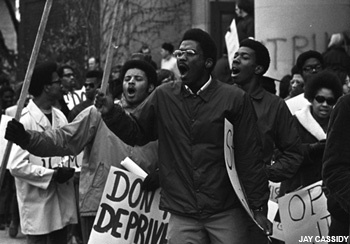 Black Action Movement strike at the University of Michigan, 1970. And tiny Ann Arbor, Michigan, was right in the thick of it. Ann Arbor doesn't seem to get as much recognition for its contribution to the sea change of the sixties as do other places such as Berkeley or Madison, Wisconsin. But it was just as important to the decade's growth and evolution as either of those two cities. Ann Arbor saw the birth of Students for a Democratic Society — one the biggest and most influential youth groups of the sixties — in 1960, and was home to the SDS leadership for the first half of the decade. 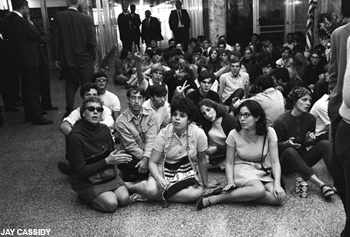 Sit-in at the Washtenaw County Building, 1968. Ann Arborites also played a key role in the establishment of the Peace Corps, following a speech by presidential candidate John F. Kennedy on the steps of the Michigan Union in October 1960. Ann Arbor was the birthplace of the White Panther Party, which would eventually play an important (although indirect and greatly ironic) role in the downfall of the Nixon administration. In addition, Ann Arbor (not San Francisco) was the city that saw the election of the first openly gay person to public office in the United States in early 1974. The Michigan History Project plans to produce the definitive history of Ann Arbor during the 1960s, including several deluxe illustrated books as well as a series of graphic novels and one or more films. Click here to read more about A260: Ann Arbor in the Sixties.